Note: The AA3000 and A3000+ were two attempts by Commodore to build an AGA based Amiga 3000, although they were two separate projects the designs and goals were very similar and because neither project hit the market the boundaries between the two projects is very blurred. It is unclear what information applies to which project , or even if it applies to both. Therefore this page is intended for both the AA3000 and A3000+. Battery Backed Up Clock: Yes, uses "Barrel" shaped battery. The AA3000 is a very rare machine with only a handful in existence (estimated between 3 and 6). Commodore are rumoured to have produced as many as 50 but destroyed almost all of them around the time they went into liquidation. Unfortunately the AA3000 was never officially released to the public. The AA3000 and A3000+ were essentially different projects, with similar goals. The case design was basically the same as the A3000 case (including PSU) probably with some minor modifications for the Zorro slots as they are aligned slightly differently. They are about 1" closer to the case and obviously the label on the case would be changed to reflect the machines name. 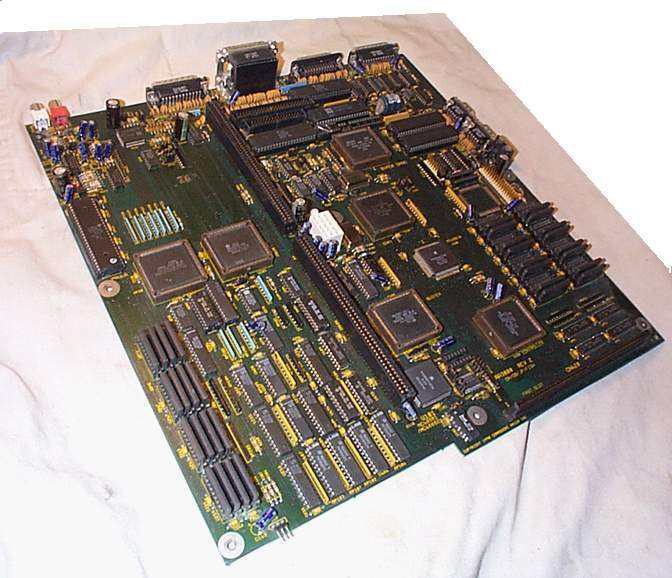 This machine is almost a hybrid between the A4000 and A3000 containing a fully functional AGA chipset on an A3000 style motherboard with SCSI onboard. 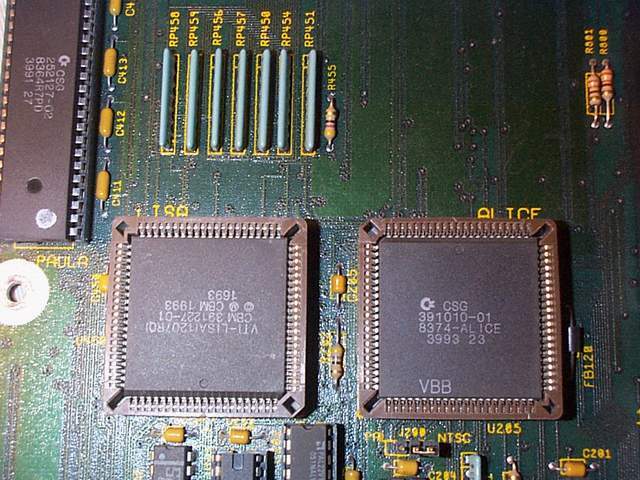 The AA3000/A3000+ lacks the Amber chip which is found on the A3000 for scandoubling and flickerfixing the Amiga's native display for output to a PC style SVGA monitor. 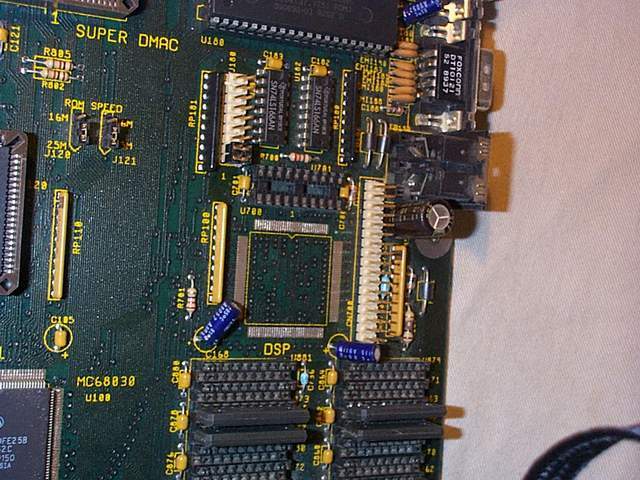 The motherboard contains space for a planned DSP which was rumoured to provide 16bit audio and addtional maths processing capabilities. The machine also contains a standard 200pin CPU Fast Slot for adding processor cards as found in the A3000 and A4000. The particular machine shown in the photographs is actually used with a Commodore A3640. 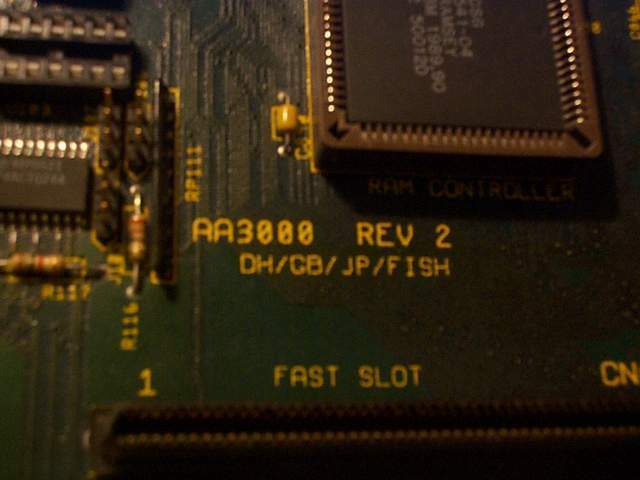 The machine also came with the same Kickstart, in the same ROM format as the A4000, that is KS 3.0 on two ROM chips. 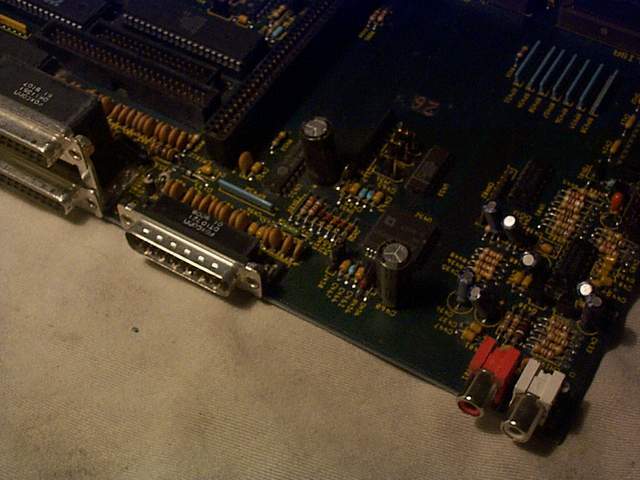 The Zorro and ISA slots were also on a daughterboard (riser card) which is connected vertically to the motherboard. Ever fancied an A3000 with the AGA chipset and DSP? Well try and get your hands on one of these babies! :) This machine is reported to be very stable and runs AGA games just as any A4000 or A1200 would. "The Amiga 3000+ was the first computer based on the Pandora chipset (which was later dubbed AA, then AGA). Revision 0 of this system first booted successfully in February of 1991, thanks due to a chip revision that got the display logic actually working. This is revision 1, which completed the audio subsystem, and moved to surface-mount components. As the name suggests, this system was being designed as a drop-in replacement for the existing Amiga 3000 motherboard. In addition to the features everyone knows from the Amiga 3000, and from later computers such as the Amiga 4000, the Amiga 3000+ sported the AT&T DSP3210 digital signal processor as a coprocessor. 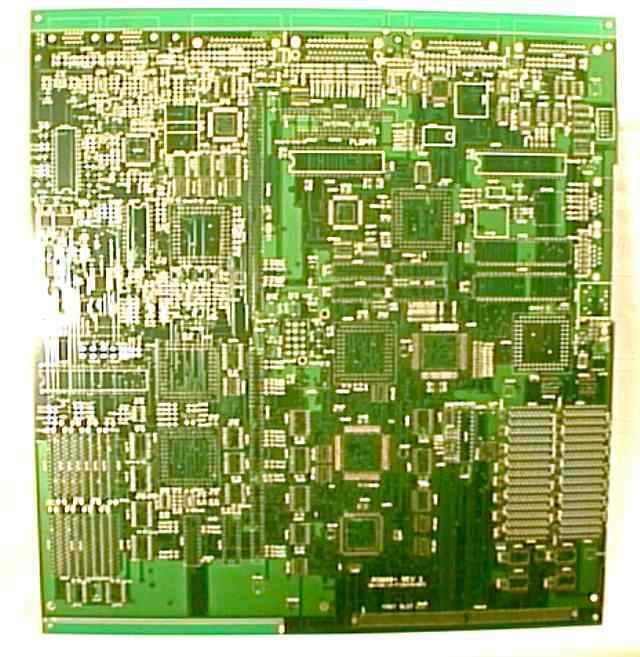 You can see quite a bit of support circuitry for the DSP in the upper lefthand corner of this board. There was an audio CODEC here, designed to allow 16-bit, 2-channel recording and playback. This was very cutting edge at the time, such chips, common today, where just becoming available. In addition, there was a separate mono CODEC with hardware phase correction, which supported modem protocols up to V32. 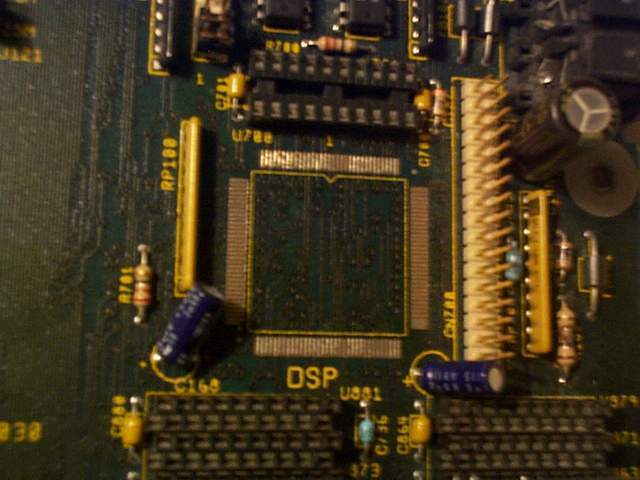 The actual DSP was located above and to the right of the CPU.